Anti-abortion activists at the 2017 'March for Life' in Washington DC. Photo: Dimitrios Manis/Zuma Press/PA Images. All rights reserved. There were also “Game of Thrones-style CGI pictures of babies being sacrificed in some sort of fantasy orientalised temple,” she said, describing the images on display at the protest, organised by the campaign group Abort67. The self-styled “genocide prevention” group has used such graphic and emotionally-manipulative pictures since its formation, 11 years ago. Recently, its visibility has increased thanks to growing links with other anti-abortion groups in the UK and abroad. Abort67 presents its campaigns as connected to the struggles of US civil rights leaders like Martin Luther King Jr. It has compared abortion to slavery, the Holocaust, and the hundreds of thousands killed on Burma’s ‘Death Railway’. Abort67 was named after the year, 1967, when the UK’s Abortion Act was passed. Introduced as a private member’s bill, amid heated debate, it legalised abortion in all of Great Britain – and not Northern Ireland – with certain, controversial restrictions. There is a legal time limit – 24 weeks – and two doctors must approve a termination. If a woman ends a pregnancy outside of these restrictions, for example by buying abortion pills online, she could be given a life sentence in prison, along with anyone who assists her. Half a century since the 1967 law was passed, British doctors’ associations have urged ministers to fully decriminalise abortion. In Northern Ireland, where abortion is almost always illegal, the road to reproductive choice is even longer. Women’s rights activists protest Northern Ireland's DUP party and its policies, in London 2017. Tiocfaidh ár lá 1916/Flickr. Creative Commons. (CC BY-ND 2.0). Some rights reserved. Meanwhile the anti-abortion movement has not given up: instead, it appears to be consolidating, with new alliances being struck between different groups and increasing transatlantic cooperation. Since 2014, Abort67 has held regular vigils outside Blackfriars Medical Practice in Southwark in London. It has also been active in Brighton and Manchester. When we spoke, Stephenson was travelling back to the capital from Nottingham, on a fundraising and recruitment tour across the UK. He told me that the group is non-denominational and that its projects have, over the last six months, grown “in numbers and scale and the complexity” involved. Satellite groups are being established in cities including Cambridge, Brighton, Leeds and Nottingham. Image-based campaigns are “more effective,” said Stephenson, though they “haven’t really been tried in the UK, that much, on the scale that we’re doing.” Recently Abort67 invested in a truck on which to mount their billboards, to increase their visibility. “I got involved with this about 11 years ago when I saw a picture of a ten-week foetus that had been aborted, and my wife was pregnant at the time with a baby of the same age,” Stephenson, now 43 years old, told me. “I’d never seen that before, and that was a catalyst to motivate me to change my path, and try and find a way of bringing it to an end,” he said, of the image which was circulated by infamous US anti-abortion group the Centre for Bioethical Reform (CBR). Founded in the early 1990s, CBR says: "abortion represents an evil so inexpressible that words fail us when attempting to describe its horror. Until abortion is seen, it will never be understood." The group is led by attorney, war veteran, and former member of the Reagan administration Gregg Cunningham, who, as a two-term member of the Pennsylvania House of Representatives, introduced legislation to end public funding for abortion in that state. Many of the images used by Abort67 are believed to be late-term miscarriages, taken in the US. Reproductive health groups such as Planned Parenthood and Marie Stopes International have alleged that the images are, in fact, of stillborn or miscarried foetuses. Stephenson said such pictures shocked him, and that Cunningham had a “convincing strategy to bring [abortion] to an end.” He then founded the Centre for Bioethical Reform UK (CBR UK), with Abort67 as its public campaigning – or “consumer protection outreach” – outfit. “Not a man for numbers”, Stephenson said he works full time for the organisation, leading a team of “about five or six” staff members and around 120 volunteers. For the 2016-2017 financial year, CBR UK reported receiving £100,000 in grants and other donations, up from £69,000 in 2015-2016, according to the group’s most recent filings at Companies House. These filings also disclose an affiliation with the much larger CBR in the US, which has an annual revenue of more than $1 million, and say that CBR UK “shares some administration” with the lobby group Christian Concern For Our Nation, known as ‘Christian Concern’. Read other stories in 50.50's series tracking the backlash against our sexual and reproductive rights. Stephenson said that Christian Concern have provided basic human resources and administration support over the past couple of years, but that they have less of a role in the organisation these days. He said they are supporting the formation of a new CBR group in Ireland, where pro-choice activists and their opponents are preparing for for a referendum next year over that country’s regressive anti-abortion laws. The US and UK groups also convene yearly in London at the Clarkson Academy, a kind of anti-abortion training camp to share tactics and how to “make an abstract concept concrete in people’s minds,” said Stephenson. “Both pro-life and pro-abortion groups have links to the US, and I think it’s time both sides were honest about this,” he said, adding that he also has regular group calls with other affiliated organisations in Europe, Australia and Canada. 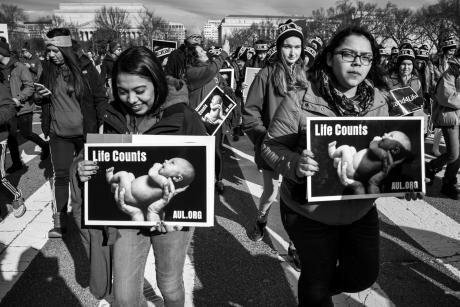 “Both pro-life and pro-abortion groups have links to the US, and I think it’s time both sides were honest about this." He also argued that shock tactics such as graphic imagery are “a very British way of campaigning, that the Americans adopted, going back 200 plus years,” rather than the other way around. “Slave trade abolitionists were using graphic, disturbing images of Africans being brutalised by the slave trade. And the British abolitionists worked with Frederick Douglass and other American abolitionists,” he said. The group made a similar argument in a 43-page response to a recent Channel 4 Dispatches exposé of Abort67. 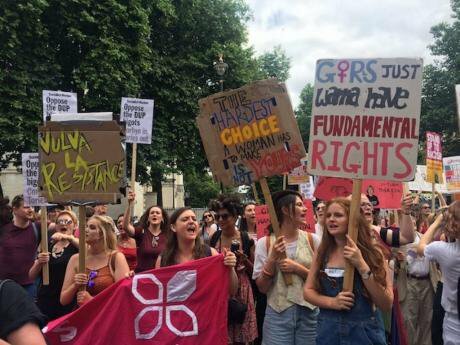 Outside clinics in Ealing (a borough in west London) and Portsmouth (on England’s southern coast), “buffer zones” have been established to protect women seeking legal abortion services after persistent harassment by anti-choice activists. 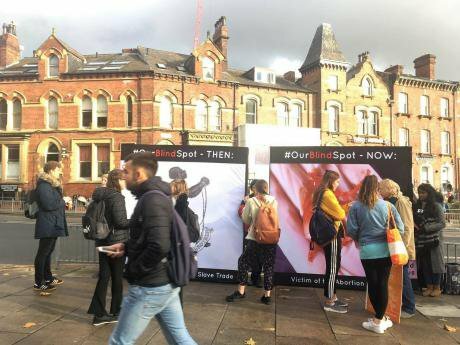 Campaigns for such buffer zones, to prohibit protests immediately in front of clinics, are now picking up steam including in Richmond and Brixton (also in London), as well as Birmingham, supported by the British Pregnancy Advisory Service’s Back Off campaign. How to protect women from harassment by anti-abortion protestors has become a political issue. In October, 113 MPs, including the Labour party leader Jeremy Corbyn, signed a letter to the home secretary calling for action. Anna Veglio-White, from Ealing’s Sister Supporter group that helped lead the campaign for buffer zones where she lives, strongly disagrees. “It’s not about belittling their beliefs or being aggressive towards them… it’s not even really about abortion – it’s about access to a legal healthcare service, and you’re trying to stop people from going in,” she said. She described how protesters outside clinics in Ealing launched abusive phrases at women, offering them little pink or blue rosary beads for the soul of their “child”. Pam Lowe, a sociologist at Aston University in Birmingham, said that these protests do not appear to influence the proportion of women who decide to go through with a termination after seeking such services. Lowe told me there is now greater cooperation between different strands of the anti-abortion movement in the UK, which she said is indicative of a “consolidation” similar to that which occurred in the US in the 1980s. Primarily Protestant Abort67 has a growing presence at the Catholic-organised March for Life, for example, and its activities are becoming more visible as it embraces new relationships with other anti-choice groups. Stephenson also told me that they work with “anybody of any faith or no faith” adding that they were “glad” to partner with “pagans supporters… Catholics or evangelicals”. He said they have “been meeting up with some of these other pro-life groups that we’ve not really had a chance to sit down with before,” giving as examples the Good Counsel Network and the 40 Days for Life campaign. 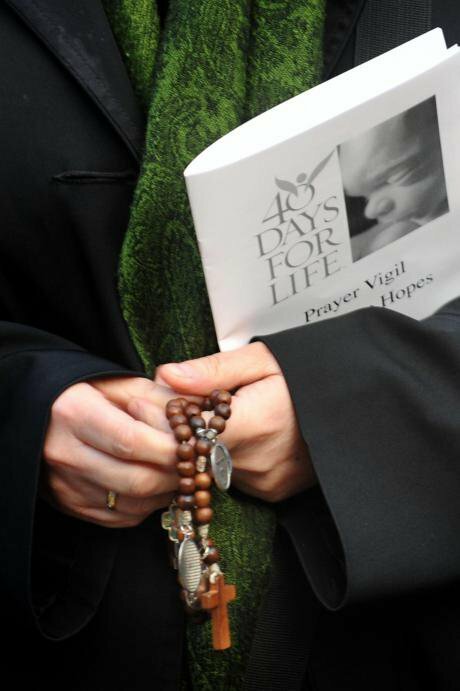 A '40 Days for Life' protester at a 2012 anti-abortion vigil in London. Photo: Ian Nicholson/PA Archive/PA Images. All rights reserved. “I think there’s a growing sense of unity, which is great because it means you’re not duplicating, you’re not wasting resources... you’ve got better lines of communication,” Stephenson said. Such denial of female agency is the nub of the anti-abortion movement’s misogyny, and is also reflected in the 1967 law’s requirement that women get permission from two doctors to end an unwanted pregnancy.